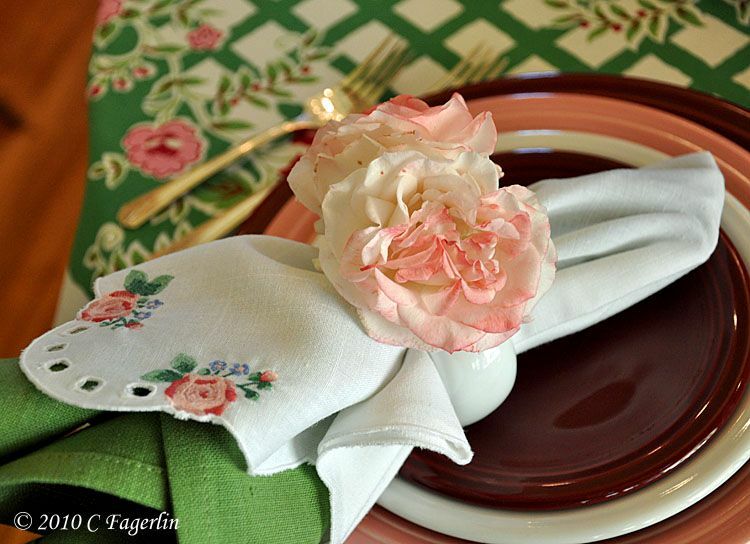 Welcome to another Tablescape Thursday hosted by Susan over at Between Naps On The Porch. 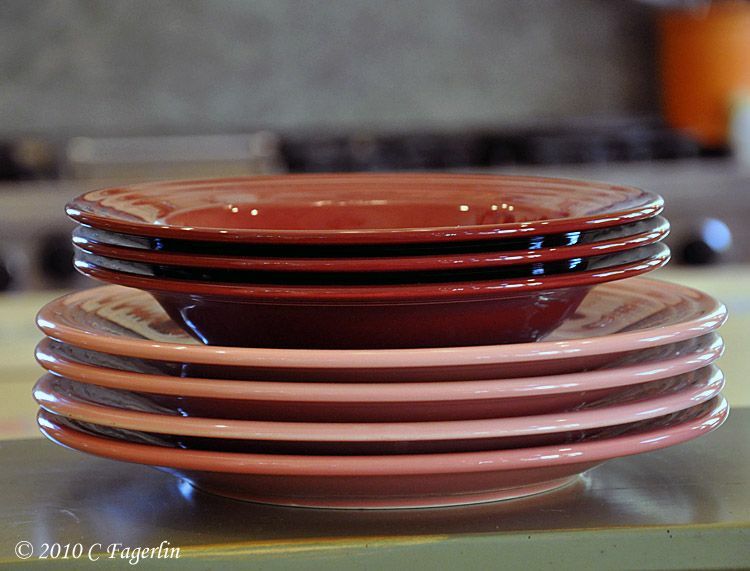 Come on over and see all the beautiful tables and a vast array of dinnerware! Flatware is vintage Deauville, napkins are from Tuesday morning and the embroidered rose napkins are from Crate and Barrel years ago. The candle holders are vintage Metlox. 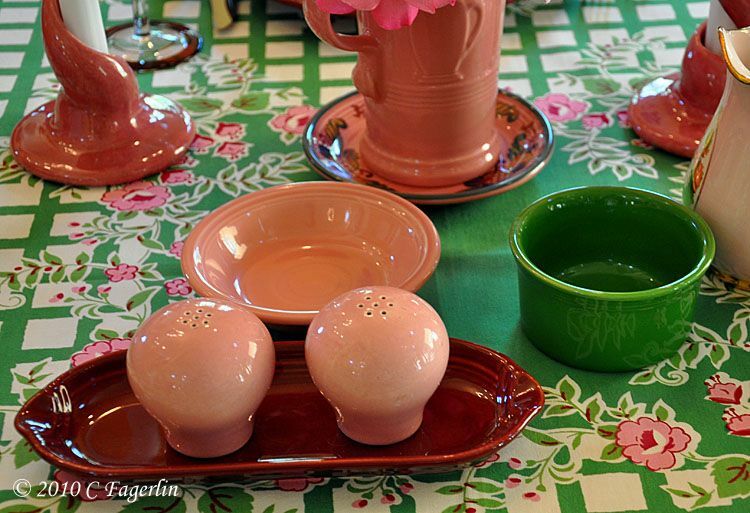 The pink pitcher and salt and pepper shakers are vintage Homer Laughlin. 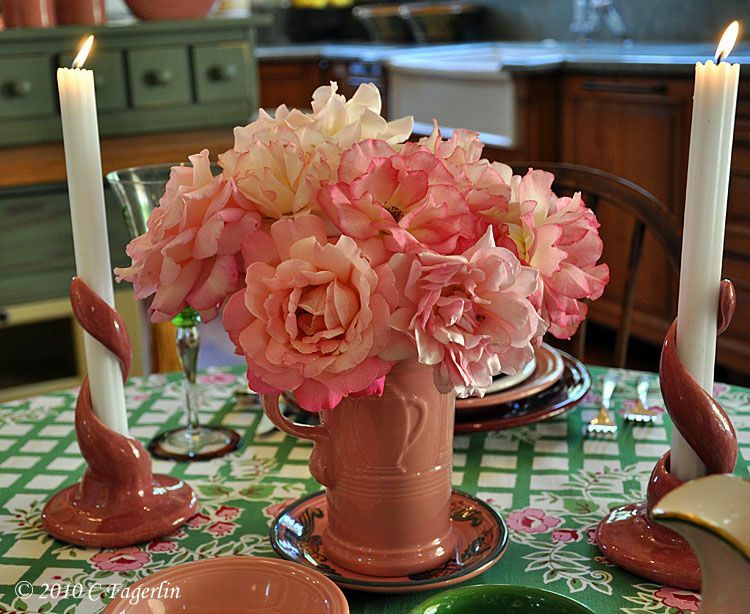 Thanks for coming by for another Tablescape Thursday here on The Little Round Table! 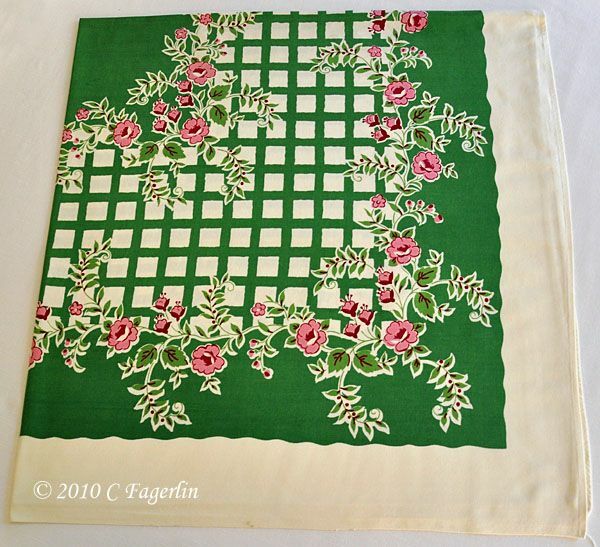 Today's tablecloth is listed in the database and can be reached directly by clicking the image below. How beautiful. I LOVE the candlesticks and the wine glasses. Of course the tablecloth is out of this world. The whole tale is so pretty. I look so forward to your posts. I'm with Marydon, I want your kitchen too, and all your tablecloths, and all your dishes! Seriously, you have some beautiful things. Thank you so much for taking time to plan and photograph all your lovely things. It is so nice to come home on Wednesday evenings from work and know I will get such a nice treat of seeing your next creation. Beautiful table! 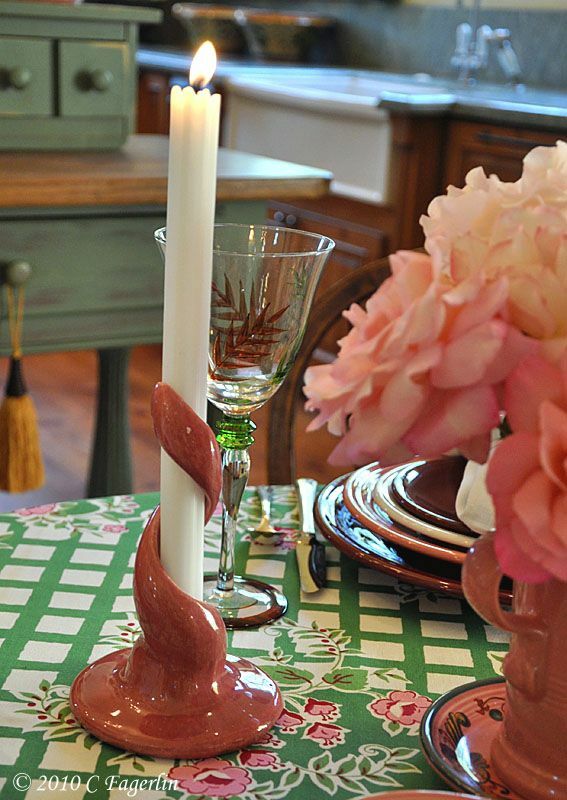 Love the color scheme ... and those candle holders are fantastic! Your kitchen is fabulous! And so is your little round table. OMG- I AM STILL PICKING MY JAW UP OFF THE FLOOR! Your kitchen is a dream! I love the farm style sink and the mini drawers on your island! 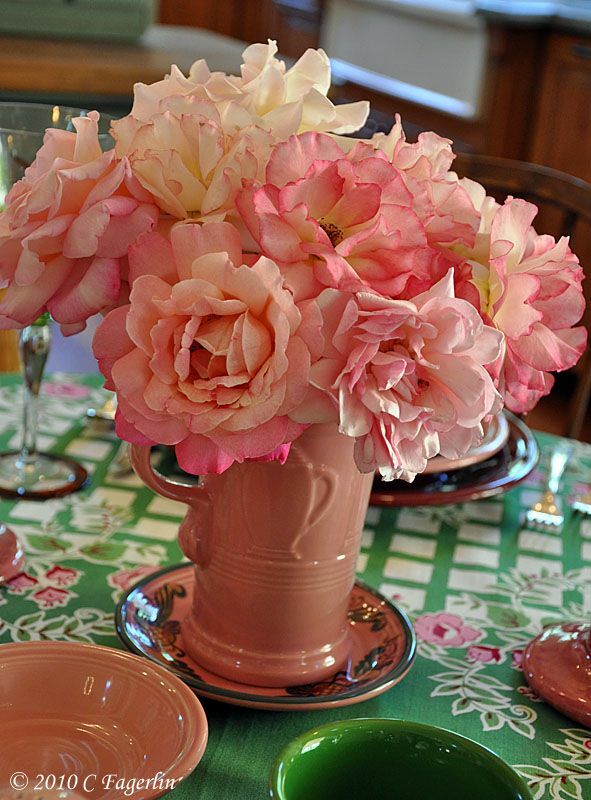 Your tablescape is devine!!!!! Those candlesticks are quite interesting. I love them. I love this color scheme! Gorgeous roses! This gorgeous and one of my favorite color combinations! 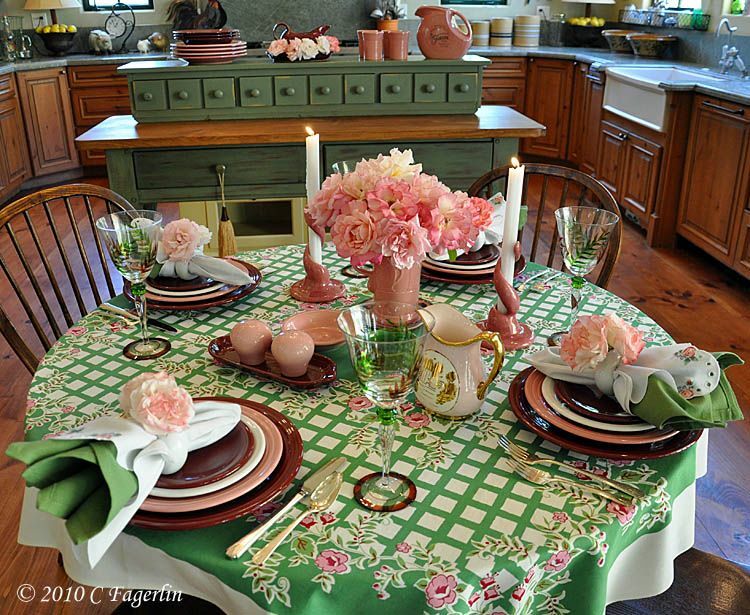 The vintage tablecloth is amazing, as is your kitchen. 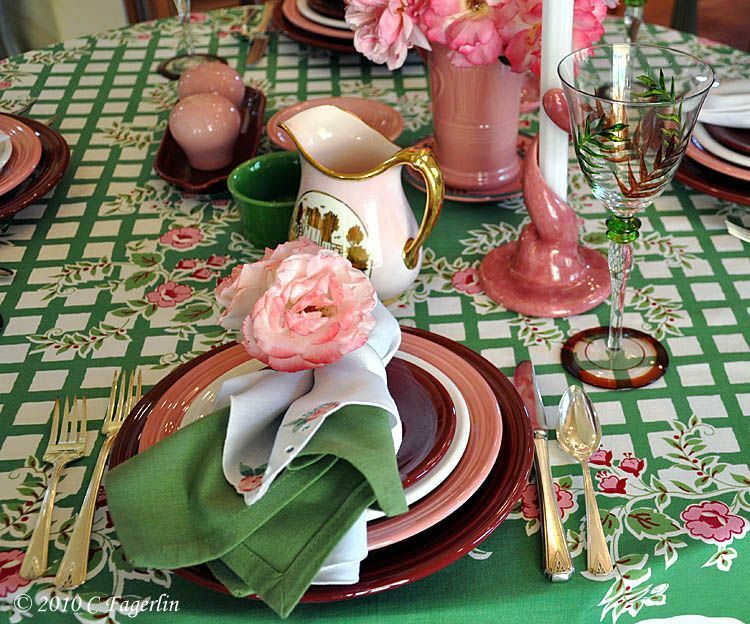 The tablecloth is great-I love the greens and pinks. I also love the candleholders. Very unique! 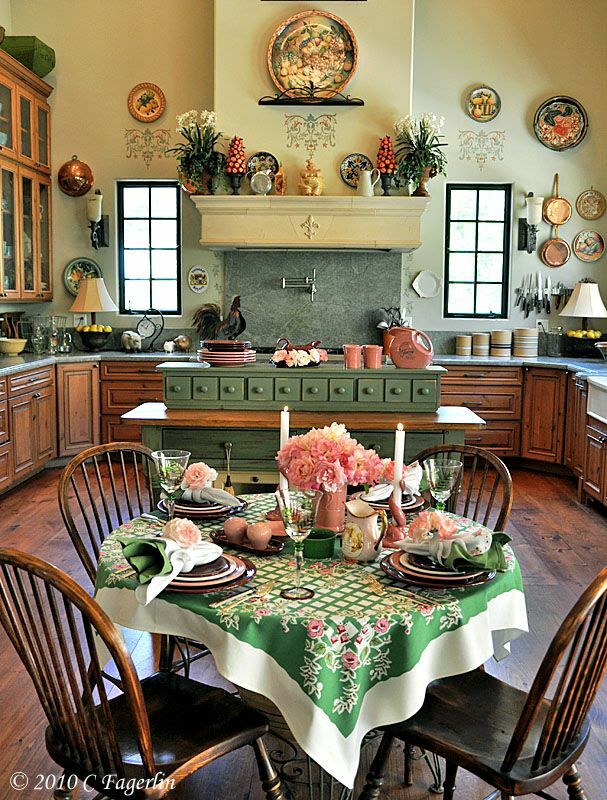 This has to be the prettiest tablescape I've ever seen with Fiesta dishes. I love your tablescape. 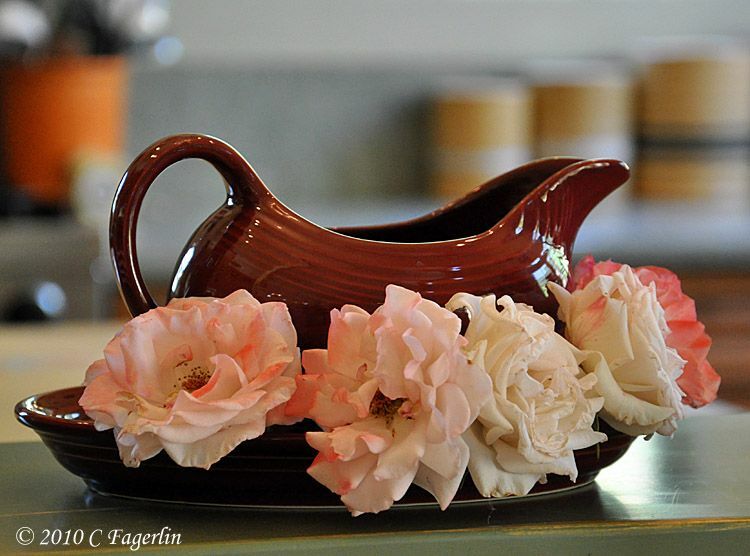 Everything looks so perfect and it looks wonderful in your kitchen. I'd love to sit and have breakfast or any meal in there. And the depression area tablecloth is soooo pretty! I love how your dishes picked up on the colors in it. Beautiful! 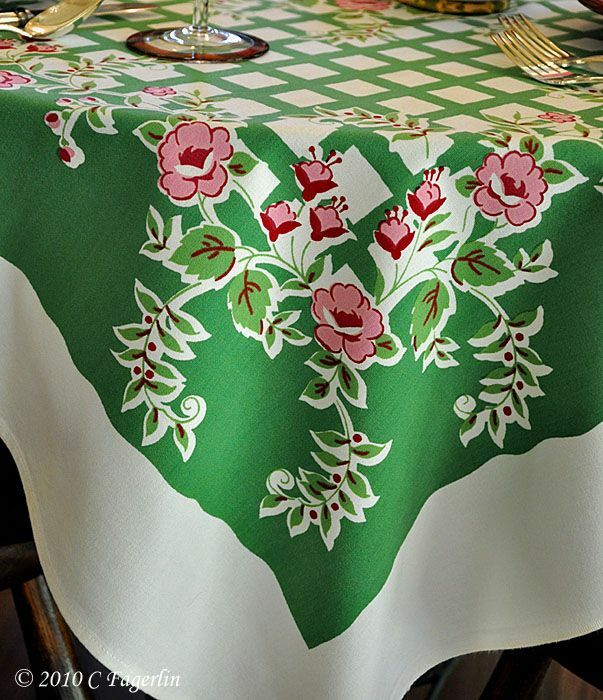 This is a tablecloth that I just love, something about the grid pattern and the little wild roses I think. Thank you all for coming by for a visit and I hope you'll stop back again soon. 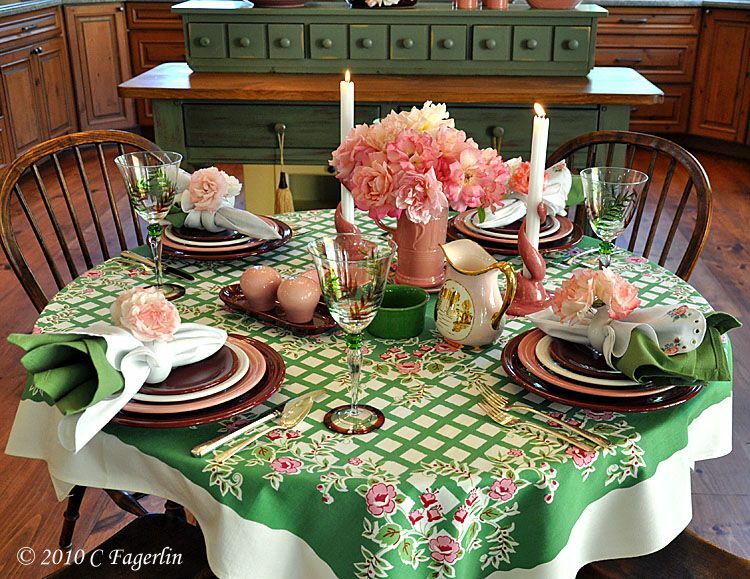 Very pretty, I love the embroidery on the napkins! Simply stunning. I love those candle holders. You always have exquisite festive colors! 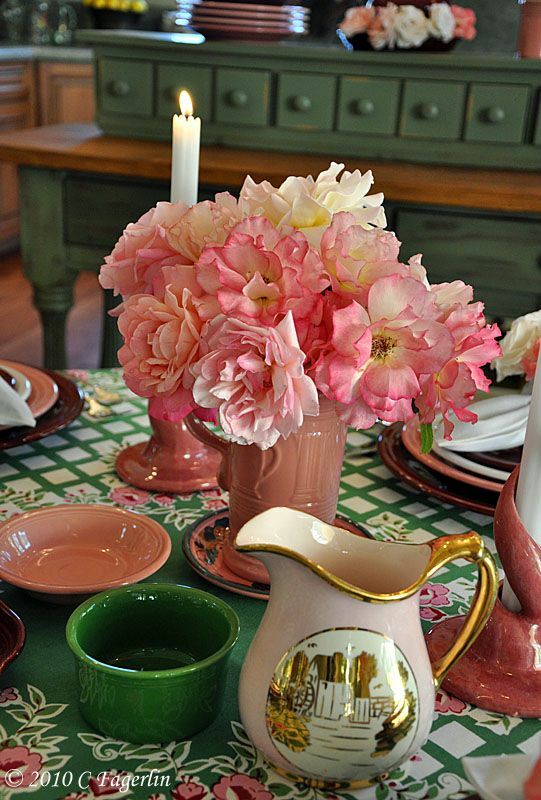 Just love the deep pinks and greens and your Fiesta ware! I hope you've had an opportunity to stop by my two giveaways this month! I just love the colors that you put together here. 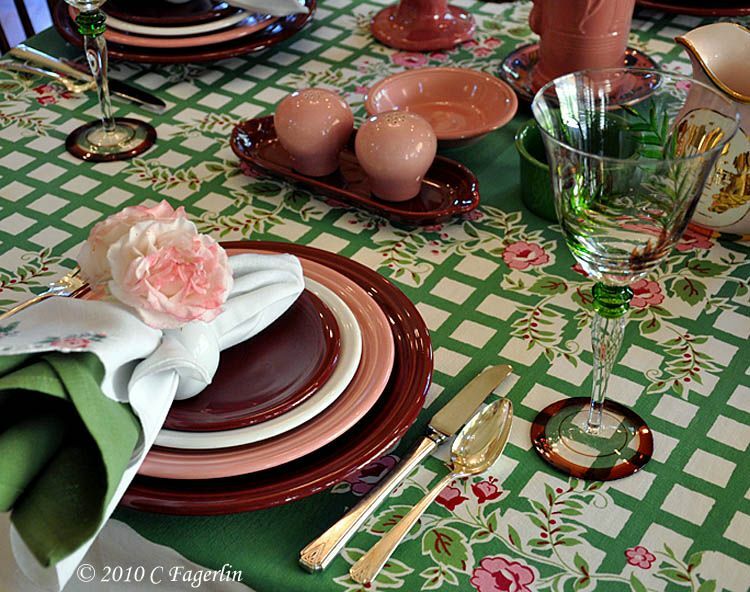 That vintage tablecloth is so pretty. Another stunningly beautiful table, Candy! 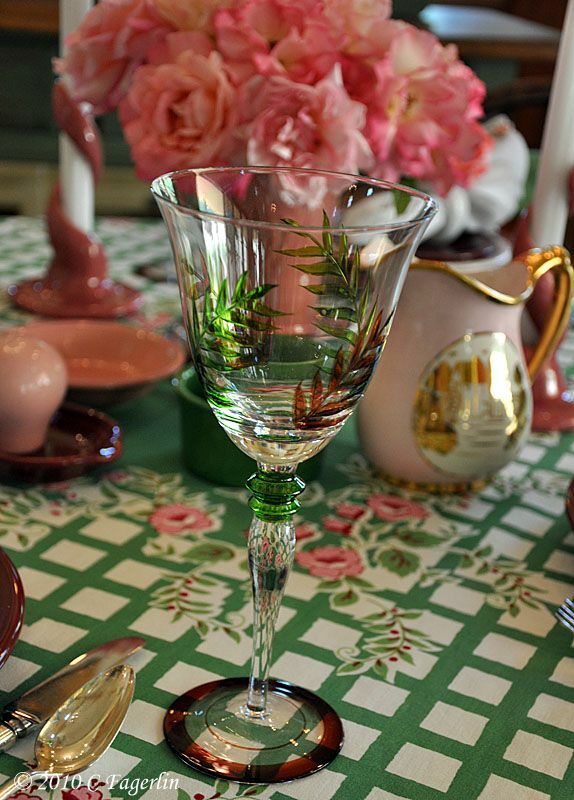 I love the pinks and greens together, and those glasses with ferns echo the ferns in the tablecloth perfectly! Candy, how pretty is this. I love the color combo, this carneol pink is so nice and in combination with the burgundy plates just awesome. And the roses complements this colors so well. Really stunning. This dining place with the whole kitchen is so wonderfull. What a fabulous tabelscape! 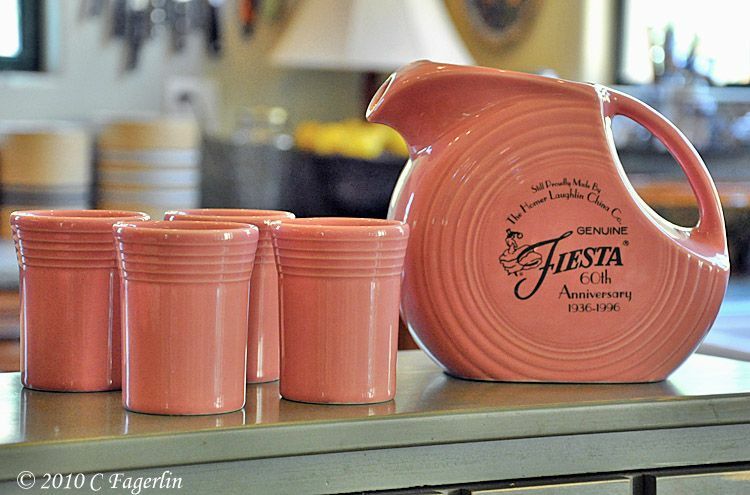 I love the Fiestaware I used to have a pitcher like that but in blue. Your kitchen is big and gorgeous love it! Have a great day! Thank you all so much for stopping by to see the Pink Roses, I do appreciate it! More kitchen stuff going on with a reveal in a post tomorrow afternoon for Furniture Feature Friday and Saturday Night Special, so please come back for another visit. I want to walk right into that kitchen and have my morning coffee. Absolutely delightful! Thank you both, I do SOOOO love my kitchen too!